Dare to Care Helps Again! Dare to Care for Children, a Leland based 501-3c children's based charity has done it again! 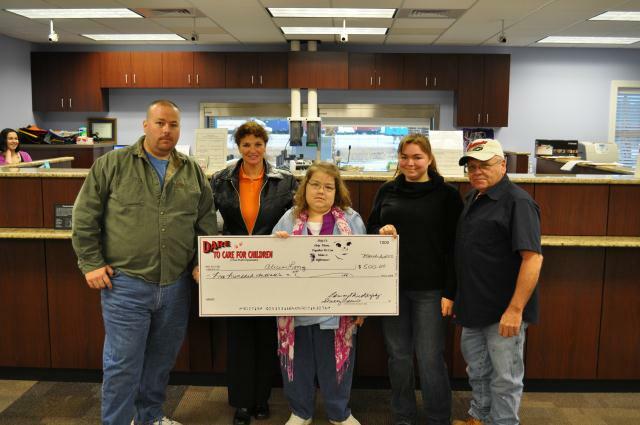 On March 02, 2010, the Dare to Care for Children Foundation presented a check in the amount of $500.00 to Alicia Long. Alicia found out she was in kidney failure in Nov. 2003. She started dialysis in March 2004. She was put on the transplant list in Oct. 2005, and received a transplanted kidney from a family friend. In 2007 the transplanted kidney went into rejection. She started back dialysis in Oct. 2008 . In Nov. 2009 she had gotten really sick and after 3 months, had to go back to Duke University to have the transplanted kidney removed. She is now in the process on getting back on the transplant list. The Dare to Care for Children Foundation is now conducting a raffle to benefit Alicia Long. The winner will receive an autographed guitar sign by the Lovin Spoonful, and personally signed by Steve Boone of the Lovin Spoonfull to the winner. Tickets sales will run from March 1st thru April 30th, with the drawing being held on May 3rd. Ticket prices are $10.00 each or # for $20.00. For additional information, contact Skip @ 910-297-0617.